How I Became a MUA | Tips + Advice! I posted the picture above on New Year's Day as a little reflection on 2016 - the first image was taken December 2015, the second December 2016. I hadn't even realised how much my makeup skills had improved over the course of the year! In 2016, I also qualified as a Makeup Artist, and then went on to get a job with MAC - something I never would have imagined happening! 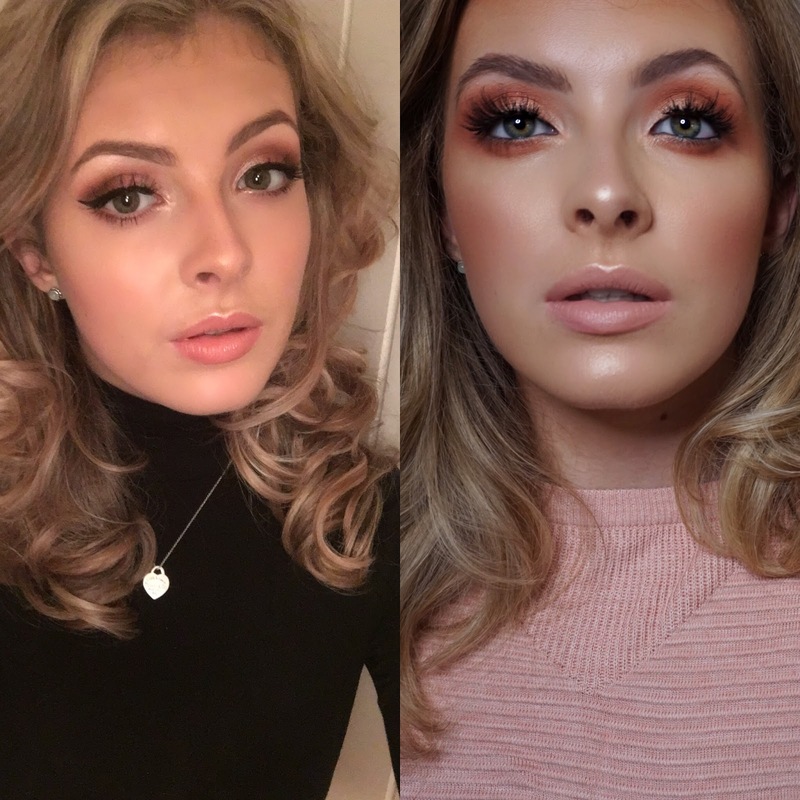 I had a couple of requests to share more about how I became a MUA and some advice etc, so here's a comprehensive post all about my experience. I may also do a separate 'How to get a job at MAC' post if that's of interest too. For me, makeup has been a love of mine since I left school at 16. I started off watching YouTube tutorials and reading blogs, and to this day, it's still something I favour over watching TV or Netflix. I think it's really important that you're sure this is for you before you pay for a course. Therefore, I recommend being self-taught to some level - there's so many amazing makeup channels out there, and honestly practice makes perfect! Another thing I've found really helpful is starting my makeup Instagram - this is something I've fully thrown myself into from the beginning of 2016, and I can't believe how much it has grown. Getting amazing comments and feeling really part of the makeup/beauty community has motivated me to keep going and keep trying out new looks and techniques. Getting featured by amazing brands also makes me strive to improve - if you'd like to see a post about growing your Instagram let me know too! Therefore, I'd highly recommend starting a makeup Instagram if you'd like to become a MUA - it's so interesting to see how much you improve. Doing this for a good few months made me sure that I wanted to become a qualified MUA and it wasn't just a phase. - How long do I want to do the course for? I wanted to get qualified ASAP, so I chose a 12 week course but there are courses that run for 1+ years. - Is it a day or evening course? - Do I want a recognised qualification or just a course with a MUA? For a job in the makeup industry, you really do need a recognised qualification from someone like VTCT. If you just want to learn some skills for your own makeup, or to top up after doing a recognised course, then I'd say to do a course with a MUA or studio. These aren't recognised in the industry, and could prevent you getting a job! - How much do you want to pay? I eventually chose a course with Chill Out Training Academy which was Level 2 in Makeup. Personally, if you feel you are quite strong with makeup, I'd go straight for Level 3, as I felt this was a bit too easy for me (but the course was shorter so I stayed with this one). Once I got this qualification, I had already got my job at MAC so I basically just started with that! Alongside this, I also do freelance makeup - for that it's all about advertising - use Instagram, Facebook etc and good old fashion business cards are great too. A lot of salons allow you to rent chairs to use for freelance makeup, so that way you have a base, rather than travelling to clients' houses etc. And with freelance, it is definitely a case of practice makes perfect - whilst you are studying, try and do as many makeups as you can, just to get practice on different face shapes, skin types and tones as the more experience you have the better! I hope this post is somewhat helpful if you're looking into becoming a MUA yourself! As I said, if you'd like a post about how I got my job at MAC, let me know (I thought the post would be way too long if I joined both of them together!). If you have any other questions, don't hesitate to email or DM me. MICROBLADING | My Experience and Before & After!